We so much enjoyed meeting so many people from all around the world with the same interest and passion for the sport thanks again. Hi Cheryl, the tour guide will review routes every evening, so you can bring your tour book to the meetings and take notes. We only got confused once when a route was poorly marked, but even then we ended up on the correct path. Also, most young people in Austria speak perfect English, plus there are always other cyclists around for clarification. This was our first "self-guided" tour too, and it was fabulous! Pat, how was the "doing your own navigation? " my friend is afraid to go w/o a guide. Are you literally following the Danube? We're looking at may. The staff were wonderful and attentive and the biking equipment was excellent. It was tremendously satisfying to enjoy this beautiful part of the world on bike and then return to the comfort of the boat each evening. Looking forward to the next trip!! I enjoyed the cycling, the scenery was generally really lovely and revitalizing, with options to see different things. The staff were very pleasant. The bikes were good and the bike staff very helpful. The choice of outingings were very enjoyable. Overall it was a relaxing cycling holiday which was what I was looking for. I found that the Tripsite staff, (especially Carla), were very helpful in answering all my questions . Thank you! Our bike barge trip along the Danube in October 2017 was a great experience. Biking was fabulous, the paths we're all very good for the most part. The scenery was beautiful. We were very pleased with the friendliness of the staff and all the accommodations made for us. The food was all nicely presented and abundant. Our group of eight friends definitely would like to do another trip! Great scenery, great exercise, and an overall wonderful experience! It was wonderful to have all the logistics taken care of. All we had to do was get up in the morning, have a hearty breakfast, get on our bikes and head out for a different adventure every day. Not too difficult! On board, the staff went out of their way to be helpful and accommodating. The ship amenities were great. Our on board entertainer was super and we danced most evenings. The cycling was scenic, varied and interesting and not too difficult. I liked the cruiser style of the bike. Sitting more upright made sightseeing while riding very easy. Overall a great experience that I can't wait to repeat! The Danube River is beautiful. My most memorable day was the last one of our week, when we cycled mostly through parks along the Danube in Austria. Weather was pleasant and the quietude, along with the autumn colors and few remaining flowers, was spectacular. The daily rides were the perfect combination of distance and scenery. The ship and staff were excellent as was the food served in the dining room. We would definitely recommend this ride and cruise to our friends. Scenery que sheets needed to be more precise. Several of us got lost on our last day and therefore couldn't tour the Melk Abbey. I was very disappointed we ended up biking 50 miles instead of 26. 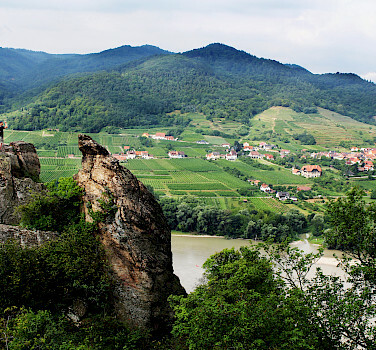 Visiting the Wachau valley was my favorite part of the trip. Entertainment on the ship was the only down side and that was just a small part of the trip. I really enjoyed the first and last days a lot which were in the beautiful countryside along the Danube. It was good to see the cities but the visits too short to really visit anything in depth. I recommend the Mozart concert which I really enjoyed. I loved meeting people from other countries and wish we could have had meal seating change every couple of days to mix with other people who also were interested in meeting others. Favorite Part: A short cycling day through quiet, autumnal countryside, took us to Bratislava leaving us with oodles of time to spend exploring colorful backstreets and the rise to the impressive castle. The comfort guide was somewhat disappointing and the on ship tour director was disorganized and dismissive. While the comfort guide did give some good suggestions, the bike tour through Vienna would have better been replaced by a bus tour, as the group was very large, traffic was heavy and the whole experience was somewhat dangerous to anyone not a very experienced rider. We were led to believe that the bike tour in Vienna would be easy, on nice paths , not crowded or busy, whereas the opposite was the case. The tour guide through Vienna, a local, did not wear an identifying vest, and travelled too quickly, More instruction for the riders not experienced with electric bikes would have been appreciated. A session especially on the electric bikes while on board the ship would be an improvement. We paid extra for a top level cabin, but it seemed to be nearly exactly the same as the cabins one level down. While the food was good, and the service was excellent, we wearied of the sauces typical of continental cuisine and the small salads. Bike lunches and water were good. Fresh fruit was available at breakfast. This was our third bike tour with Tripsite and we were glad we came back. We we were able to see 3 new countries for the first time (Czech Rep, Slovakia and Hungary) with the same excellent logistics, accommodations and food we experienced on our other two trips. Tripsite staff was there whenever we needed support in any country. We'll be back! The experience on the barge far exceeded the expectations for my wife and the other 6 members of the group. The quality of the food, the excellence (and friendliness) of service , and the outstanding visuals of the meal presentations were an absolute delight. If I were asked for recommendations (I left these comments on the end of cruise comment card), would be to improve internet service and to make sure there is at least one English speaking television channel available. Other than that, everything was wonderful. Most Memorable Part: Waking up each morning at a new port in the middle of no where with castles and beauty all around. Tip: Take all the bottled water you are able to as not freely available (although I drank the ship's water and it was fine). Don't rely on internet. It was a fantastic trip. I will definitely recommend it to friends and family! The whole experience was more than I expected. Just join in and enjoy life. Most Memorable Part: Riding on the bike paths without having to worry about road traffic. This was our first bike and barge trip. The 4 countries trip was awesome. Albert was an amazing tour guide and was available all the time to ask questions of and chat with. His info sessions were informative, we would have missed a great deal without his tips and suggestions. Amazing food. Friendly staff willing to do anything to make the trip memorable. No hassles ever! Wish coffee during the day was included but no big deal. We were on the top level with big picture windows. Immaculate boat, the Carissma. We booked the spa and enjoyed the expansive area, chilled fruit juices, robes and towels. Nice hot tub for two, romantic. We are already looking for another Tripsite bike and barge next year. This is an amazing way to see cities, get some exercise and fresh air, enjoy the countryside and visit little villages for coffee or drinks. We did city bike tours in Budapest &Vienna (booked on board) and they were well worth the money. Before the trip we had a number of questions and Mikky at Tripsite was great with answers. I was so happy she answered right away! Thanks for a memorable week. This was the second trip on the MS Carissma from Sept 24 - Oct 1- along the Danube. Great scenery- the best of the two trips. The river views of vineyards, historical sites were really beautiful. The staff on the boat were exceptionally customer focused and responsive to needs. The food was very good and well presented with the exception of the fruit plate which needed a little more imagination to meet the standard set by the other menu items. The hired tour guide for our group was not able to answer questions about the history or other information on some of the sites we spent time in or passed along the way. He knew the route well but other information was not forthcoming as he said "it did not interest him" when he did not know. Tips - do some research on some of the stops along the way to determine if the site is worth a stop along the way. Make good use of the extra time in Vienna and Budapest. Scenery was beautiful. Biking was not overly strenuous. All in all very enjoyable. It was great from beginning to end. The only thing I might suggest would be perhaps a better map on a couple of the days for our biking excursion. We found our way, but got a little confused in a couple of spots. Staff was excellent, tour guide bent over backwards for us, food was delicious, etc. Working with Susanna prior to our trip was so easy and she answered all my questions. I would do it again! The bike routes were exceptional taking us through the most beautiful and scenic areas in the Danube Valley. We especially loved the Wachau Valley and it was Reisling harvest time! The ability to view many little towns throughout the trip along with the amazing historical buildings. The daily bike routes could have been clearer, or at least exact precise maps to follow. Biking everyday on a different path through diverse scenery and able to stop at any time to see different landmarks. Getting to see more of the countryside than if on a tour bus. This itinerary was very doable for all ages and levels of fitness.